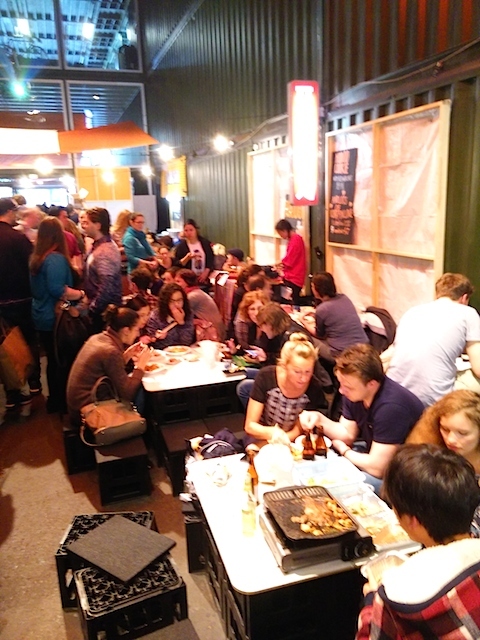 Korean street food culture is one of the most vibrant and intimate, and people in Korea drink and eat until late at night. Street vendors stalls offers great variety of food and delicacies, and people sit on plastic stools drinking soju, beers or makgeolli to accompany the food. These mobile stalls, the pojangmacha, defines Korean street food and is a peculiar characteristic of this food culture. 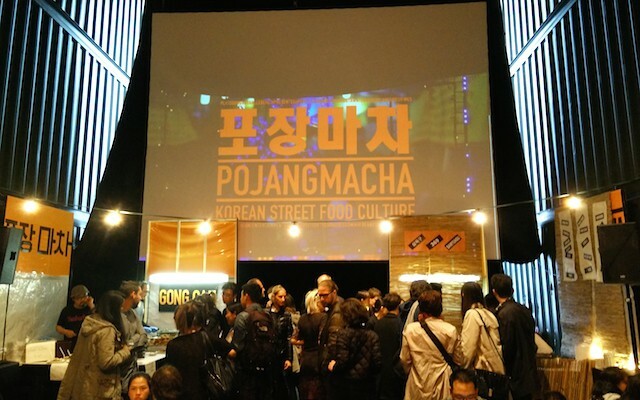 To celebrate the street food culture of Korea, the PLATOON KUNSTHALLE in Berlin (part of the PLATOON NETWORK with another art space in Seoul) organised the 15th edition of the Pojangmacha, one of the first events dedicated to street food in the city. 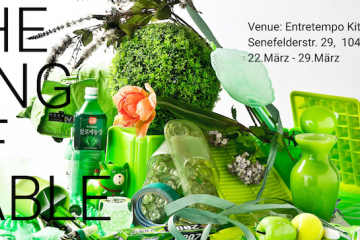 People started flocking to the Kunsthalle since the opening time and when we arrived there the place was busy and many people were eating, drinking and chatting at the tables or queuing to taste the dishes. 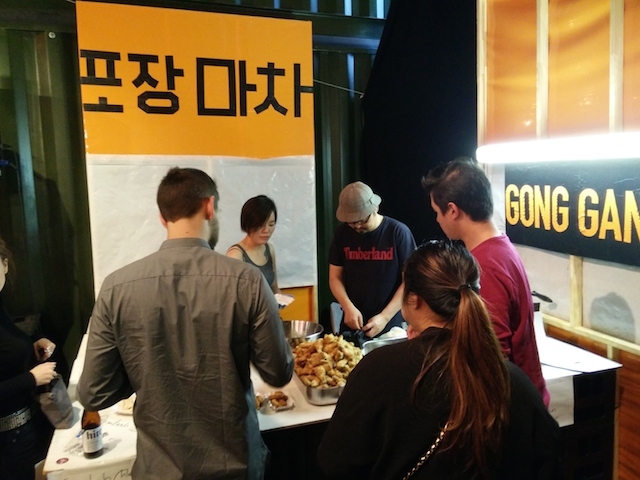 Different stalls were available offering typical pojangmacha like tteokpokki, hodu gwaja, kimbap, Dakgangjeong, bulgogi, samgyeopsal and ojingo seomyeon. 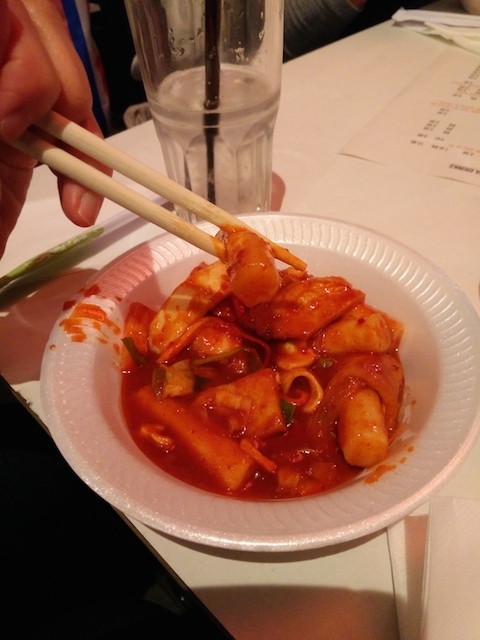 We were craving to try some of dishes and started our tasting by ordering tteokpokki – rice cakes with spicy sauce (one of our personal favourites) and ojingo somyeon (오징어 소면 spicy stir fried squid with thing noodles), an interesting variation of similar dishes like 골뱅이 소면 kolbeng seomyeon (stir fried sea snails) in spicy sauce with thin noodles. This dish probably was the most delicious we tasted that evening, perfect cooking of the squid and the noodles, with the right level of spiciness. 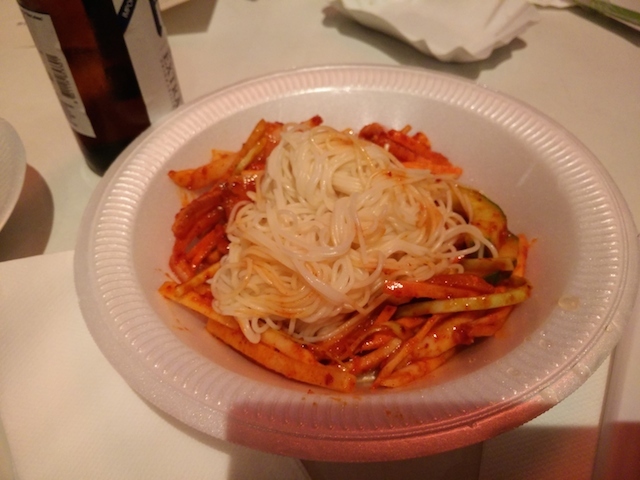 The tteokpokki was OK although it was not enough spicy and a bit too sweet for our taste. 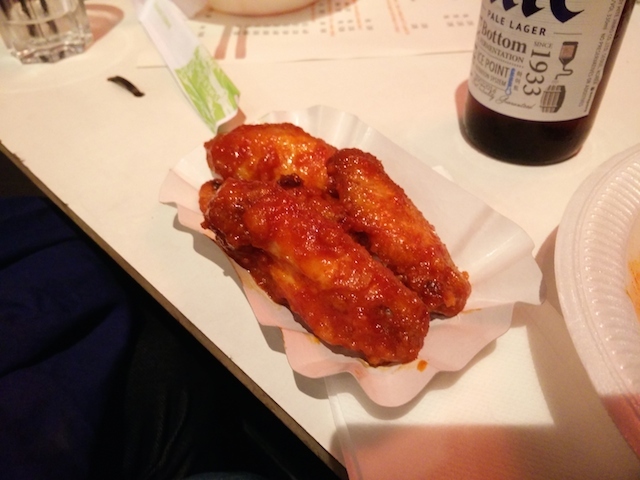 Next we tried the stir fried chicken, fried in batter and covered with spicy sauce and ginger. The dish was a big hit during the night and a long queue started to grow after we get our order. The meat was juicy and the sauce well balanced, it was delicious, even though the dish was a bit overpriced (5 euros for four pieces of chicken). 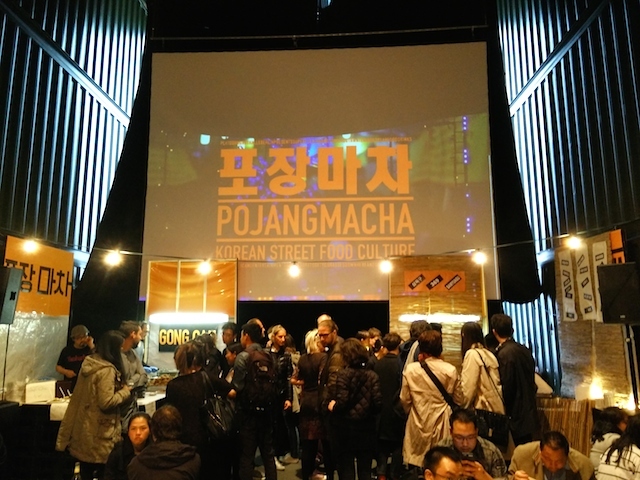 Being at its 15th edition makes Pojangmacha a long time running Korean food festival in Berlin. 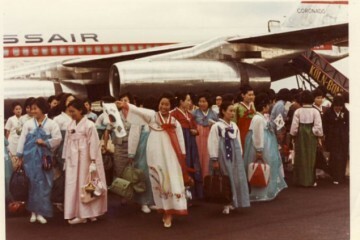 This event is a good occasion for people who are not familiar with Korean food to discover more about this rich cuisine or for people who miss the feeling of night in the streets of Seoul. 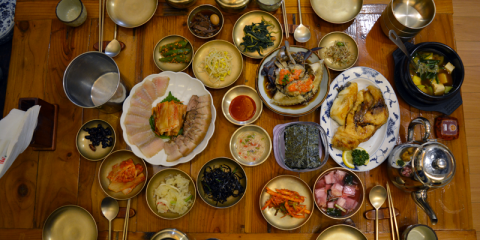 Being an important part of Korean cuisine, street food is also food that can be easily approached by people because the simplicity of cooking and because of its social aspect, being consumed with friends over drinks. 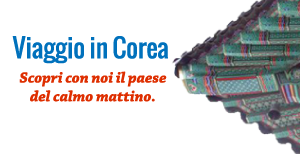 The atmosphere at the festival was good, and to give a real Korean experience, K-pop music was playing all night and there was also a room for Karaoke. We left after a couple of hours, and the place was packed with people queuing outside, so if you plan to visit it next time, make sure you arrive early!